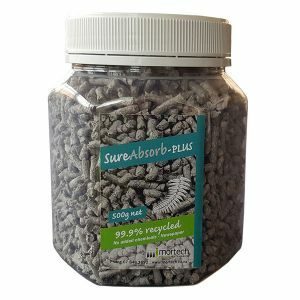 A biodegradable product made from recycled material that can be used for fluid and odour absorption. It can be used in place of other absorbing products, e.g. cavity compounds to maintain a "green" or natural treatment. This product has no plaster products and can be cremated with no residuals. Simply sprinkle inside a plastic undergarment or in the bottom of the casket to absorb any free fluid. Each container will absorb 1.5L of fluid.